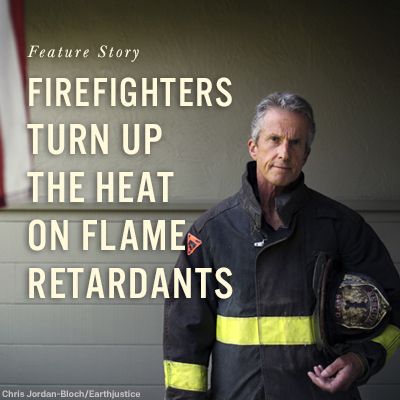 Last week was a busy time for Earthjustice’s work on flame retardants. Tuesday, January 19 marked the end of the public comment period on our petition to ban toxic organohalogen flame retardants from children’s products, furniture, mattresses and electronics’ casings. During the public comment period, the Consumer Product Safety Commission (CPSC) was inundated by a flood of comments in favor of the ban, thanks to the support of a broad coalition of advocacy groups and concerned citizens. Some of the comments came from firefighters and their families. Organohalogen flame retardants aren’t particularly effective at preventing real-world fires—and when they burn, they make smoke even more toxic. The International Association of Fire Fighters has found a link between exposure to the fumes from burning chemicals and the disproportionately high levels of cancer among firefighters. It is heartbreaking to think that these men and women are exposed to needless, insidious dangers on top of the many risks they willingly face to protect their communities. Other comments came from doctors, nurses and scientists. They wrote about their concern for the extra risks that these chemicals pose to children, since still-developing brains and bodies are more vulnerable to toxic disruption and because children’s clothing, bedding and other products are often manufactured with flame retardants. People used to think these products made children safer, but now we know they do the opposite. There were also poignant comments from cancer survivors who don’t want others to suffer the same illness. They’re right; there’s no good reason to keep using chemicals that we know to be harmful. The only people who oppose the ban are chemical manufacturers. These are just a few compelling examples from among the tens of thousands of comments submitted by groups and individuals to the CPSC. Earthjustice’s long list of allies supporting the flame retardants ban includes the International Association of Fire Fighters, the American Academy of Pediatrics, the Consumer Federation of America, the League of United Latin American Citizens, the Learning Disabilities Association of America, the Consumers Union, Worksafe, the National Hispanic Medical Association, the Green Science Policy Institute, the American Medical Women’s Association, Kids in Danger, the Natural Resources Defense Council, the Environmental Working Group, the Breast Cancer Fund, the Center for Environmental Health, Clean Water Action and many others. Our advocacy revealed the tremendous breadth and depth of public support for regulating flame retardants. Thanks to all of our partners and supporters, we’ve sent a loud and clear message to the CPSC. Now it’s up to the commissioners to act.